Stress has long been a chronic issue, however, in our fast-paced, modern-day lifestyle, people are more stressed than ever before. Stress has the potential to cause many debilitating conditions, and hearing loss is just one condition on that long laundry list of issues that could potentially be caused our worsened by chronic stress. Stress, as it was intended to be experienced, is actually an important and sometimes life-saving aspect of the human condition. Often coined the “fight or flight” response, stress helps us to quickly determine how to handle a potentially dangerous or threatening situation. It helps us to make these determinations and then gives us the added shot of adrenaline to either flee the situation or stand our ground. While this is the purest form of stress, it is not the kind that causes concern for most of us. Instead, stress becomes an issue when it is experienced on a daily basis. As humans we are very good at stressing about a number of things such as our jobs, the kids, finances, the future, our loved ones, etc. The list could go on and on. This type of daily stress is extremely harmful to our health. Acute stress (the kind we experience when we are in imminent danger) diverts adrenaline to the correct places to help us take immediate action. This same life-saving process is what takes a toll on our health long term. According to the National Institute on Mental Health, these responses to stress can “suppress immune, digestive, sleep, and reproductive systems, which may cause them to stop working normally” (https://www.nimh.nih.gov/health/publications/stress/index.shtml. Long term and constant stress can lead to diabetes, heart disease, high blood pressure, and a list of other chronic health issues. 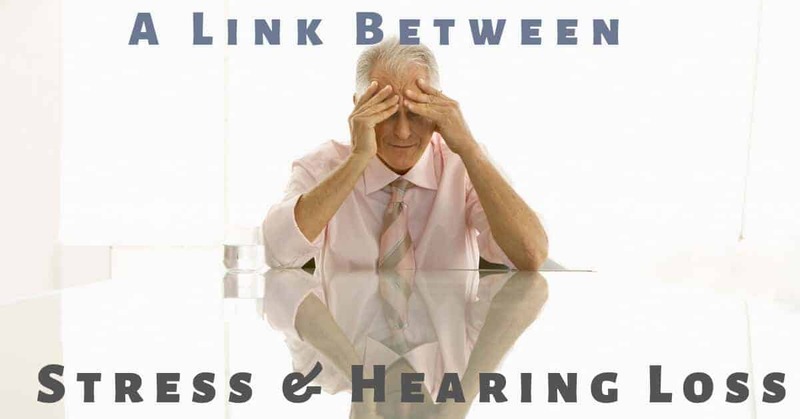 How is Stress Linked to Hearing Loss? Stress disrupts our circulatory system, which is imperative to the proper functioning of our auditory system. Tiny and delicate little “hair-like” cells located in our inner ears are responsible for transmitting sound waves into electric signals that our brains can process and understand as sounds. This is an insurmountably important aspect of our auditory system! These delicate little hair-like cells rely greatly on a good blood supply and a properly working circulatory system to function correctly. When these delicate cells are deprived of blood flow and oxygen for prolonged periods of time, they can decay or even die. Once these cells become damaged, they are unable to be restored. Damage to these delicate hair cells (whether through stress, natural aging, excess exposure to noise, or other diseases) is the cause for sensorineural hearing loss – the most common type of hearing impairment. Most Americans feel stressed. The American Institute on Stress states that there is no true definition of stress that all researchers agree upon, therefore, it is therefore very difficult to measure. While this is true, most surveys will indicate that typical Americans live under a significant amount of stress (https://www.stress.org/daily-life). It is imperative that we each take steps to help lower our stress levels to help us live happier and healthier lives, for our minds, bodies, souls (and ears). Recognize your triggers and your signs of stress. Stress presents itself differently for different people. It is important to recognize the signs that you are stressed so you can start working to calm yourself down. Some become irritable, others depressed, some lose sleep, others rely more heavily on alcohol. Knowing your signs will help you better monitor your stress levels. Get regular exercise. Just 30 minutes a day of light exercise is enough to make a difference in an individual’s stress levels. Exercise improves our circulatory system and helps us to clear our minds and feel calmer. Find what soothes you. It is important to incorporate calming activities into your daily life, and prioritize them. These activities can be anything that brings you peace, from meditation, to a hot bath, to yoga, to reading or creating artwork. Making time for these activities can help to lower your overall stress levels. Talk to your doctor. If stress has become a major factor in your life, it is imperative that you reach out to your healthcare practitioner for help and advice. Have you noticed changes in your hearing? For people over the age of 50, it is important to schedule an annual hearing test to monitor your hearing abilities. To schedule an appointment and to learn more about hearing health, contact us today at Hearing Group.